Forty percent of the food that’s produced in this country goes to waste. That’s a staggering statistic, but there are countless ways everyone from farmers and producers to restauranteurs and consumers can reduce their food waste food print. One of my favorite strategies is to shop my kitchen. It’s easy. Just rummage through your fridge, freezer, and pantry and then assemble a meal based on what’s on hand. That’s exactly what I did when I created this recipe for Slow-Roasted Tomato and Cheese Omelet. The idea for this omelet came the day after I recorded a Facebook LIVE demo on how to slow roast tomatoes. I had leftovers in my fridge, so I decided to use them in this easy omelet. 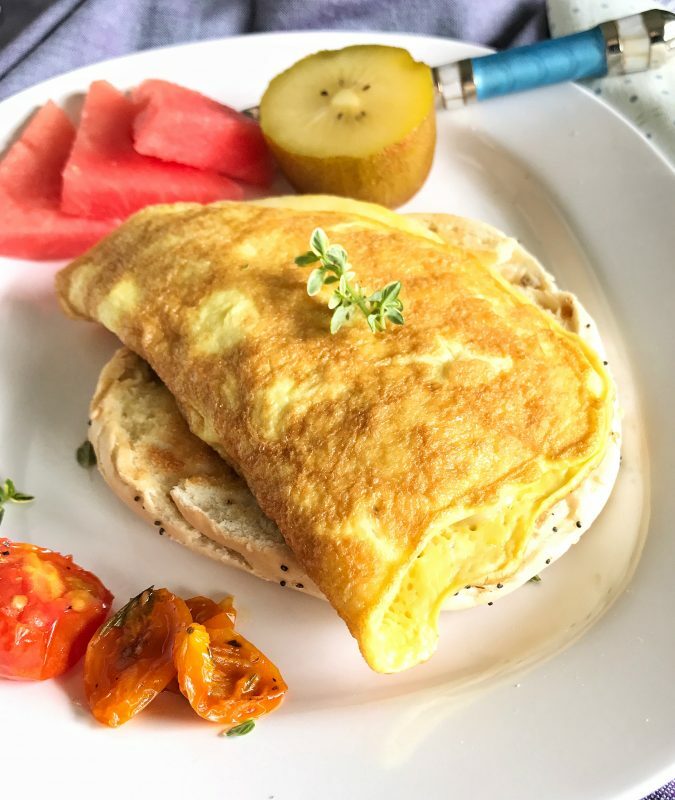 They added a subtle sweetness to the omelet as well as nutrients like lycopene, a cancer fighter. I was also inspired by this week’s LHT podcast on Food Waste Reduction and my interview with Ethical Food Warrior, Chris Vogliano, MS, RDN. 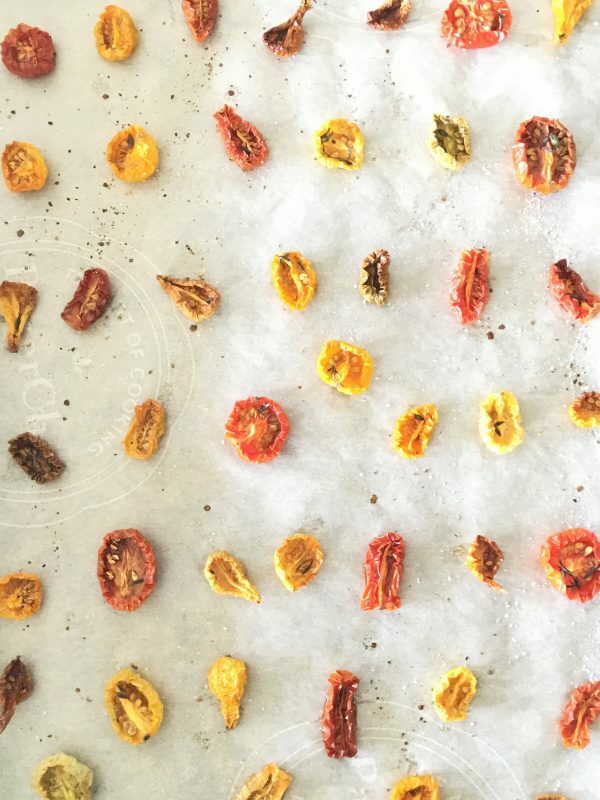 Want to learn how to slow roast tomatoes? Check out my Facebook LIVE demo here! In the meantime, before I share the recipe (which is really more of a concept than an actual recipe), I wanted to share a few food waste reduction ideas I gathered from members of my Facebook Podcast Posse group. Pam T: I keep veggie trimmings and scraps in a ziplock in my freezer. I toss them into the pot when making chicken stock. I also put fruit that is starting to look tired into ziplocks and pop in the freezer to pop into smoothies. Beth H: Something simple that works for us in reducing our food waste is to keep a magnet notepad on the side of my fridge with a running list of foods that need to be eaten. As we eat them, I cross them off. Simple, but effective, for us. Diana H: At home we have been much, much better at eating our leftovers. What I have been doing is recording on my phone, in my meal planner, when we have leftovers that we can use for a lunch on the weekend, for example. Or.. if I make a double batch of something to freeze, that also goes on my phone. I find this helps, because even though I label everything that goes in the freezer, it can be easy to forget what I have in it! Lauren P: When I cut the tops off strawberries I’ve been using them to infuse iced green tea. I think I first heard that tip from Deanna at Teaspoon of Spice. Tara F: I use any vegetable that’s past it’s prime for soup or frittatas depending on the season. And friends just bought me The Modern Natural Dyer because I was going on and on about how certain food waste could be used to make beautiful dye. I can’t wait to use by-products for something non-edible. This recipe makes one serving, but you can easily double the ingredients to make a bigger omelet or two smaller ones. 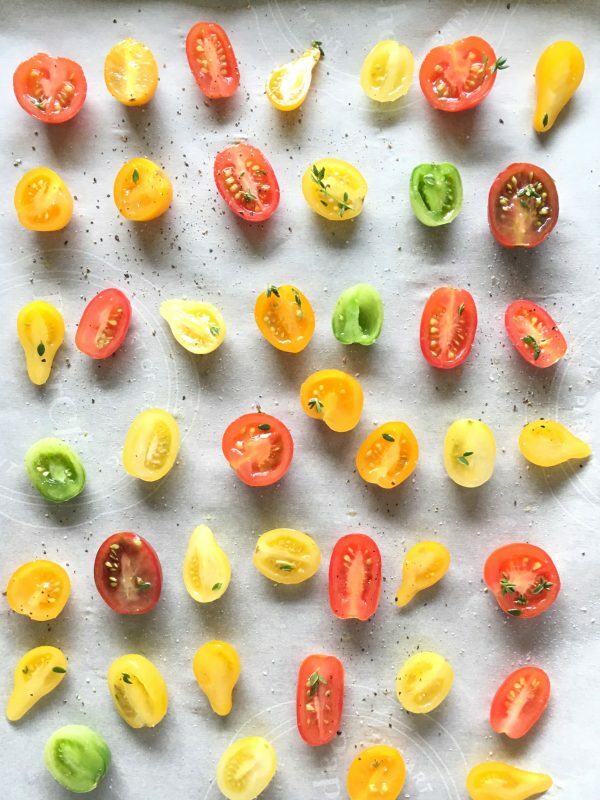 For step-by-step instructions on How to Slow Roast Tomatoes, check out this post that I did over at Today's Dietitian RDLounge. Heat a medium-size nonstick skillet over medium high heat. Spray with nonstick cooking spray. Whisk together the egg, a scant 1 teaspoon water, and a pinch of kosher salt and pepper. Pour the mixture into the skillet. Once the edges have set (about 30 seconds), pull back each corner with a spatula and tilt the pan so that the uncooked egg falls to the edges. Allow egg to set, 30 seconds. Arrange leftover slow-roasted tomatoes and the cheese slice over the top. Give the pan a shake to dislodge the omelet and allow it to completely set up, 40 seconds to 1 minute.